The story of our wedding has to be told with the story of our courtship. 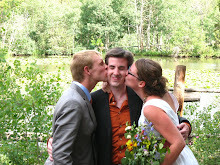 Luckily you can read the recap of the latter (well-written by my new husband) here. Bad weather, mishaps, and stains seemed to run through our relationship fabric. Everything from our first date to our engagement to our wedding was an adventure. The Washington Post even retold our story for the masses here. This adventure theme was not welcome at first. I had just gotten out of a relationship when I met Adam and could not see myself jumping into another one. The summer we met I planned on being single and just re-centering my life. But there were other plans in store for me. I met Adam, quite randomly, and we had an unexpected summer romance. We hit bumps in the road when I was hesitant to take our relationship to the next level and Adam wasn’t. 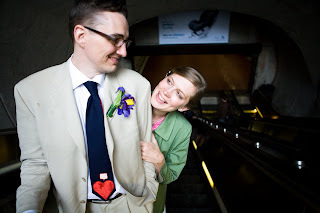 But we rebounded after much discussion and moved forward together…and I have never been happier since. 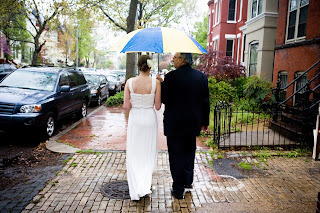 Rain was present at our first date and our engagement so it came as no surprise that as our wedding week approached, rain plagued every weatherman’s predictions. This was not just a spring shower but inches of rain and thunderstorms forecasted all day and night. We had decided to have our ceremony between our house and my parents’ house (2 blocks away) on a small triangle island in the bustling Capitol Hill neighborhood of Washington, DC. Until then, the park had been used as a frequent spot for dogs to “do their business”. It was no more than a glorified traffic median in the middle of a street, but it was a park we crossed over constantly to share meals together with family and neighbors. 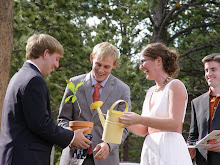 It was also a public place where people would be able to watch us get married from their front porches. I loved the idea of getting married in such an open place where anyone could witness our love and commitment. 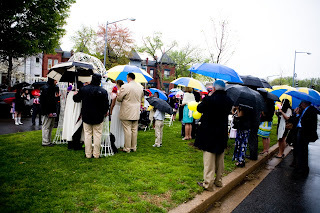 Now the stress came with thoughts of the rain deterring our outdoor venue. Thoughts of using our back-up site crept in (it was a small chapel at Historic Congressional Cemetery next to DC’s only prison). 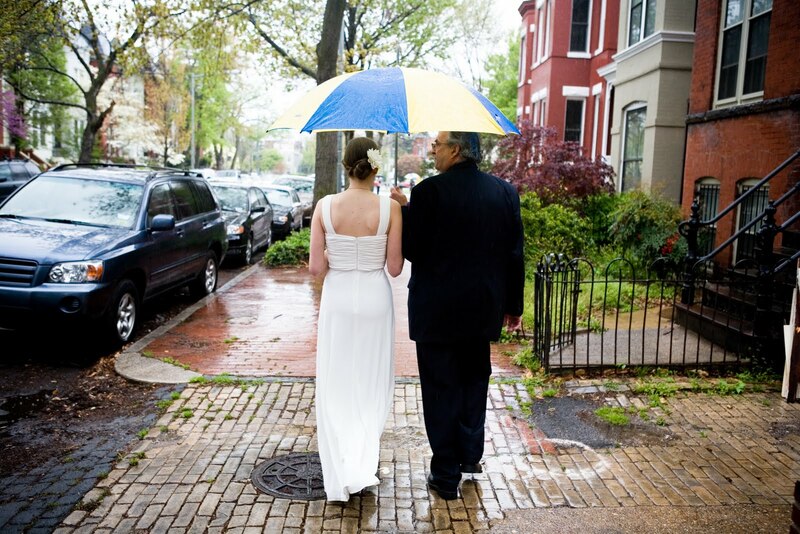 I was hesitant to move our wedding but Adam reminded me that we shouldn’t let people stand outside in almost monsoon-like conditions. 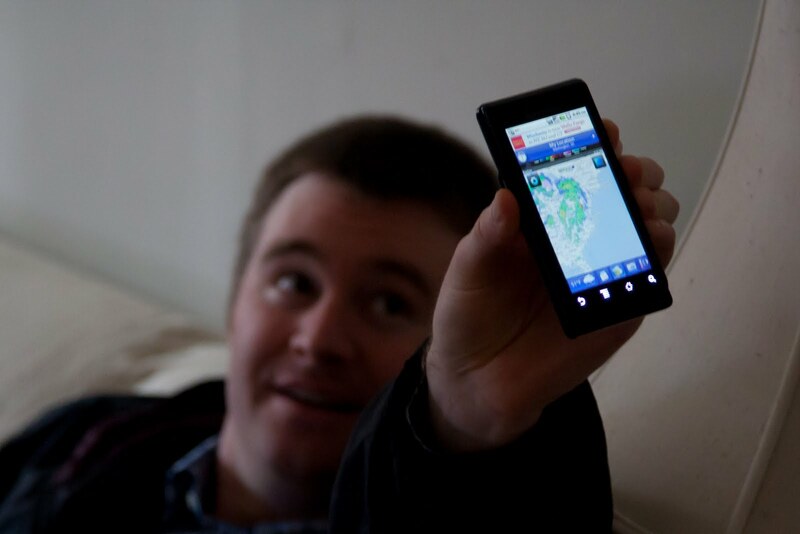 Addicted to checking the weather multiple times of day on multiple websites I started to panic. 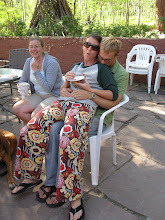 This was about the only time that our wedding planning really got me worked up. I wanted a fairy-wedding planner to pop out of the sky and fix everything. In reality, the forecast improved slightly so that there was only an 80% chance of rain for the morning. Committed to my outside, in-public wedding Adam and I decided to keep the event outside and hope for the best. We were all checking the weather up until it actually began to rain about 30 minutes prior to our ceremony. When it began to rain I surprisingly felt at ease. I was still getting ready at my parents’ house and nothing could have kept me from smiling. We bought about a dozen large IKEA umbrellas and were going to put them to good use. 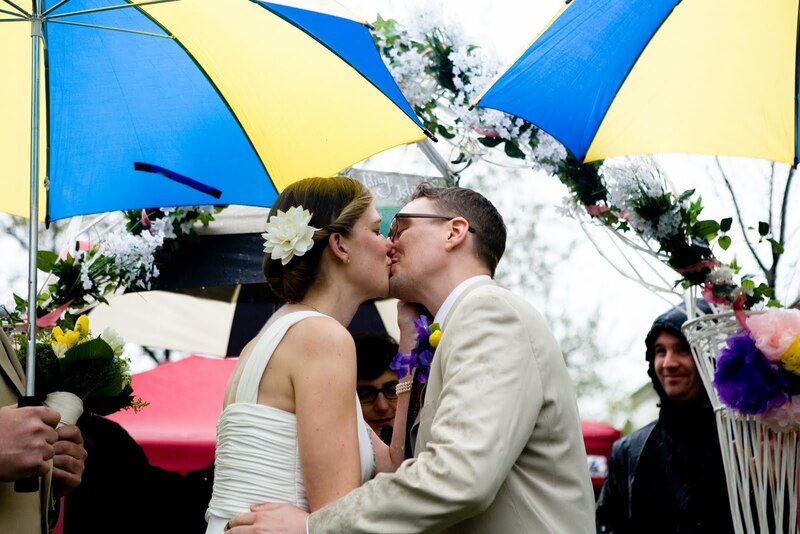 When I walked down the street, my aisle, I began to see the crowd of people under umbrellas waiting for me at newly renamed “Wedding Island”. I felt the love they radiated as my dad and I approached the front. 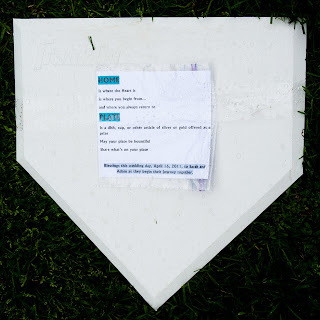 Also waiting for me was home plate, which was my dad’s well-kept surprise. I always wanted to get married at Fenway Park and Adam and mine’s first date was a baseball game. The rest of the day was a whirlwind. The ceremony was quick due to the increasing rain and wind. After we had a brunch/lunch reception at a friend’s restaurant, followed by a metro-ride home, photos at the Capitol, and a smashing after-party back at my parents’ house. I was originally worried about not having enough seats for everyone at our reception…and we didn’t AND it didn’t matter. No one danced at the reception, for which Adam had made a killer playlist, but it didn’t matter because a killer dance party broke out at the after-party. It rained and thundered at different times during the day, but it didn’t matter. In fact it made the whole day an adventure, which is exactly what it should be. 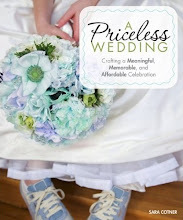 So many little details that the wedding industry deems important (wedding colors, seating charts, proper etiquette, etc.) are not. The only thing that matters is that you celebrate each other, your love, your families and friends. 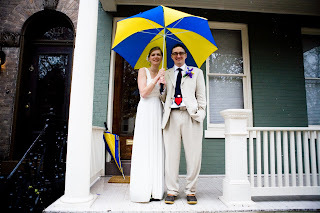 Weddings are a joyous occasion that even a little thunderstorm can’t ruin. I hope that everyone has as good an adventure as we did. Sarah begins her next adventure as a Masters of Divinity student at Andover Newton Theological School. She and Adam will be moving to Boston in September. Sarah dreams of becoming a Unitarian Universalist Chaplain (because the world needs more progressive religious voices). She loves her family (old and new), knitting, reading, baking and singing. She wishes she had more time (and money) to travel and garden. REMINDER: Only a few days left to register for the next Purposeful Conception Course: Preparing Your Mind, Body, and Life for Pregnancy, which starts on September 4. Register today!